Also, I decided this day was going to be my tiki day. 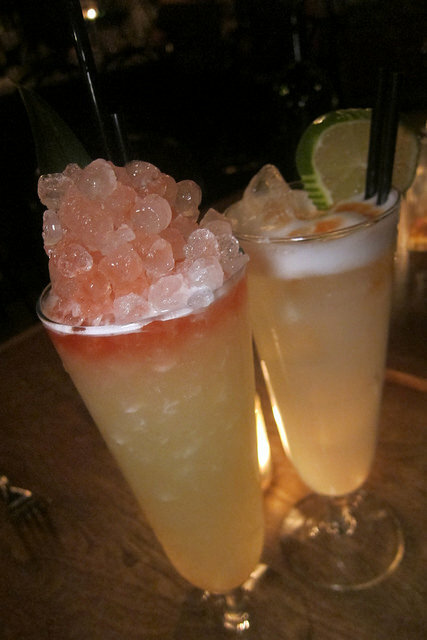 Cane and Table is perfect because they have what they call Proto-tiki drinks, modern drinks inspired by tiki and other fabulous drinks. While I was there, rum blogger Inu a Kena told me I should get the Boss Colada. It wasn’t on the menu but they happily made it. Boss Colada features Baska Snaps which means bitter schnapps in Swedish. It’s aquavit that’s been infused with wormwood that some people say it’s like malort but it certainly didn’t taste like that dreaded liqueur. The drink was quite refreshing. My friend had the Royal Fizz which was great on a hot, steamy night. 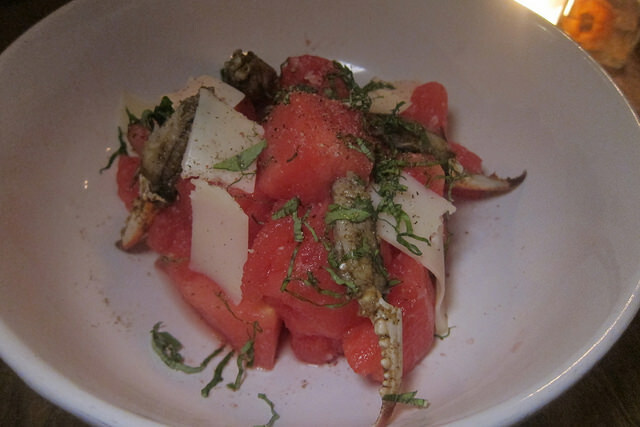 Watermelon salad sounded welcome after a long hot day of walking around the Garden District. 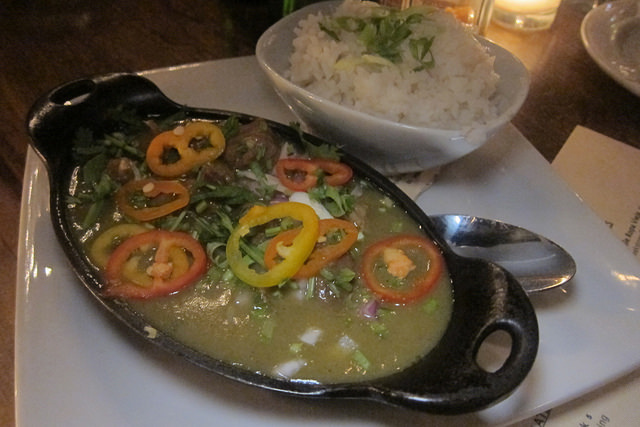 This also touted curried crab fingers (claws) but it was really more of an accent. I was a little surprised the goat wasn’t more tender for the goat curry. Still, I liked the mild curry. The rice was really good. 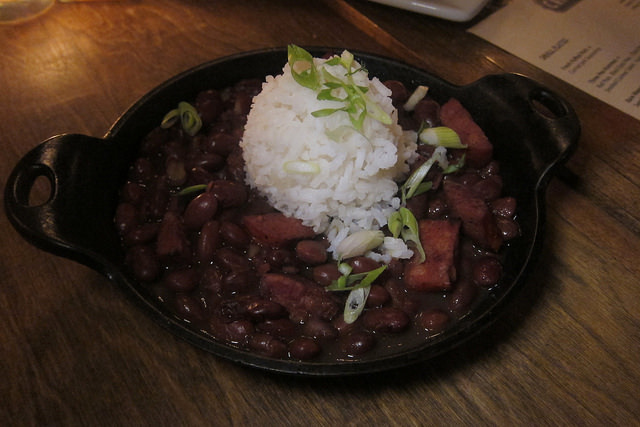 The peas and rice featured andouille sausage and Louisiana puffed rice. Between this and the goat curry, I was already becoming full. I probably didn’t need an entree but I really wanted to try more food. One of my favorite bitters is the hopped grapefruit bitters from Bittermens. I didn’t realize that when I ordered the Absent Stars it used these bitters but I was very happy to discover them as I drank the punch. 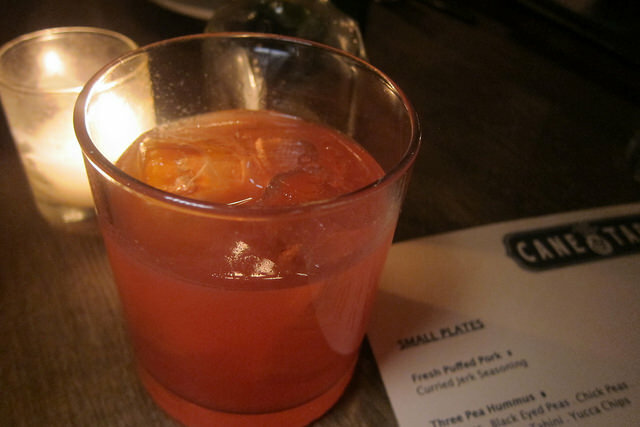 I was attracted to the drink because of the rhum agricole and Campari. The vindaloo chicken was delicious. I was really tempted to get the smothered greens since I enjoyed the version so much at Rum House but thought I should try something else. So I got curried spinach and miso broccoli. I didn’t realize the broccoli would be fried. I much preferred the wilted greens. 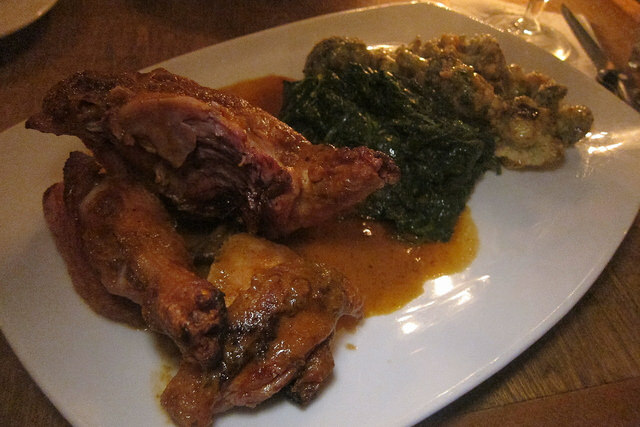 I tried my best to eat as much of the chicken which was exceedingly tender but I gave up after the drumstick. I knew I shouldn’t have filled up on the peas and rice. 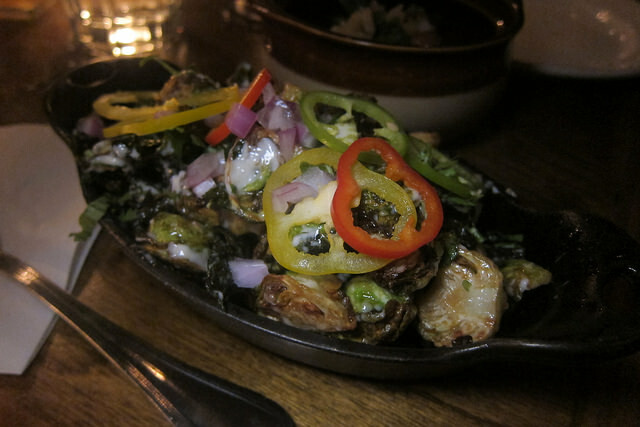 My friend had much better success with the crispy Brussels sprouts which we knew would be fried. It’s a very generous portion so we had to wave the flag on this one as well. Maybe we shouldn’t have had that snack/ happy hour at Rum House, but two of us that got entrees were overwhelmed. 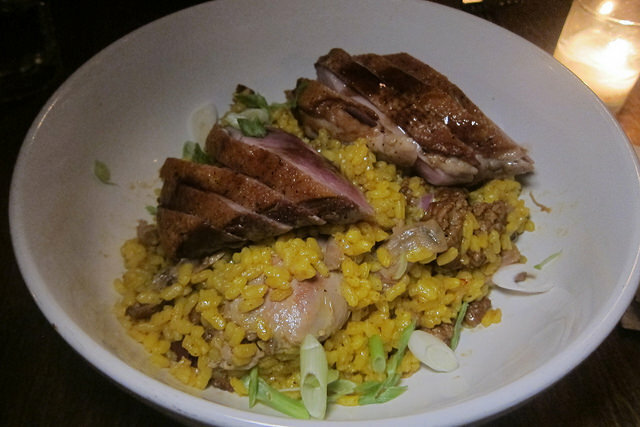 One of my friends got the duck paella which was very generous in portion. She said we should have shared one poultry dish. I did help her out with a bite or two and the duck was very good. I liked the paella too but I was over rice after the curry and peas and rice. Again, we wished we had a fridge in our hotel room. Our eyes were definitely bigger than our stomachs! We had to pass on dessert because we discovered our next stop for tiki drinks was closing soon… to be continued.